Measuring R&D productivity and innovation has been a historical issue in the pharmaceutical industry. From the concept of creative destruction developed by Schumpeter to the idea of disruptive innovation by Clayton Christensen, no one has been able to adequately define R&D productivity, especially innovation let alone quantify it. The pharmaceutical industry has suffered from lack of R&D productivity, often defined as a function of R&D costs, the overall approval rate, time frames (total number of years needed to bring a drug in the market) and the number of projects at hand (work in progress). As all of these factors increase the effect on R&D productivity is inverse, i.e. R&D productivity is declining. R&D spending: The amount of money invested for research and development. It is an absolute number and since it is not relative to the company’s size it is an abstract measure. R&D spending to sales (or else R&D intensity): The amount of money invested for research and development relative to a company’s sales. It is considered as a more accurate metric than R&D spending since it is a relative metric; it takes into account a size characteristic (sales) of the company. For instance, a mid-stage pharmaceutical/biotechnology company spends most of its cash on R&D and usually outsources the marketing/sales and manufacturing as it does not have the infrastructure to do so on its own. Instead, a fully integrated pharmaceutical company (FIPCO) spends slightly more of its costs on R&D than in marketing. Number of pipeline products: indicative of the amount of products that will enter the market (if approved) in the future. Relative to R&D spending it makes it an efficient measure of R&D productivity. Number of patents: In order for a company to be granted a patent, it has to show that its invention is useful, non-obvious and novel. The problem with number of patents as a metric of innovation is the huge time lag between the patent grant and the actual product. Also it is a combination of patents that leads to actual products and not a single patent. This, combined with the time lag involved makes it highly difficult to observe which patents have resulted in innovative products. Sales or return on investment (ROI) from new products launched: Sales can hardly be considered as an indicator of innovation if the product does not add medical value or adds value only incrementally. New products launched can also be misleading if these products are not innovative. It can be however a measure of productivity. The table below shows the relationship between the mean R&D spending to mean pipeline with mean EBITDA margin. The mean R&D spending was estimated by firstly, deflating the real R&D values from 2000 to 2010 and then finding the 2000 to 2010 mean value of R&D spending. Mean EBITDA margin was estimated by averaging the EBITDA margin of all years (2000 to 2010). One-to-One Relationship: High number of pipeline to R&D spending (or conversely, low R&D spending per product) that leads to low EBITDA margin (similarly low number of pipeline to R&D spending with high EBITDA margin). Productive: a company that has low R&D spending per product and achieves a high EBITDA margin. Unproductive: a company that has high R&D spending per product but low EBITDA margin. Eisai’s R&D spending is not that high compared to its pipeline, however its EBITDA margin is particularly low. Eisai faced a patent expiration of its Alzheimer blockbuster drug, Aricept in 2010 which accounted 40% of the net sales of the company at that year. This is the possible explanation of Eisai’s underperformance. In opposite, Gilead Sciences seems the most productive company across the sample. Its high EBITDA margin is driven by its antiviral drug business and mainly HIV/AIDS drugs, Atripla and Truvada (which make up 3/4 of Gilead’s total revenues) which expire in 2018 (Europe) and 2021 (U.S.). In order to sustain its growth at least pipeline products (5 are in phase I, 7 are in phase II, 7 are in phase III and 2 in approval/marketing) . Statistically, 0-1 of its phase I products, 1-2 of its phase II products, 4-5 of its phase III and 2/2 of its marketing/approval products can be approved (although a recent announcement by the FDA suggested that there will be a delay of the 2 products currently at the approval stage). Overall, it is expected that at the time of patent expiration of Atripla and Truvada drugs (at which time Gilead’s all other drugs will also have expired – as they have an earlier patent expiry date), Gilead Sciences will have 7-10 products in the market, 5 of which will be antivirals (HIV/AIDS). If Gilead’s revenues increase with a similar growth rate until 2019, its total sales will reach ~USD 28 bn of which ~USD 20 bn. will come from its antiviral business assuming Gilead maintains its focus on that specific area. In that case, USD 20 bn. will have to come from its 5 antiviral drugs that is expected to have entered the market by that time. It is however, unlikely for that to happen as it means that all 5 drugs will become blockbusters with average sales of USD 4 bn. To avoid the high risk of depending on very few blockbuster products, Gilead is more likely to diversify into new therapeutic areas through new acquisitions or increase its focus on its current, minor therapeutic areas by capitalising on the infrastructure of the acquired companies (Myogen and CV therapeutics acquisitions in cardiovascular area, Corus Pharma in respiratory area, Navitas Assets treatment for PAH, CGI Pharmaceuticals in inflammatory diseases, Arresto Biosciences and YM Biosciences in oncology area and Pharmasset in hepatitis C area). 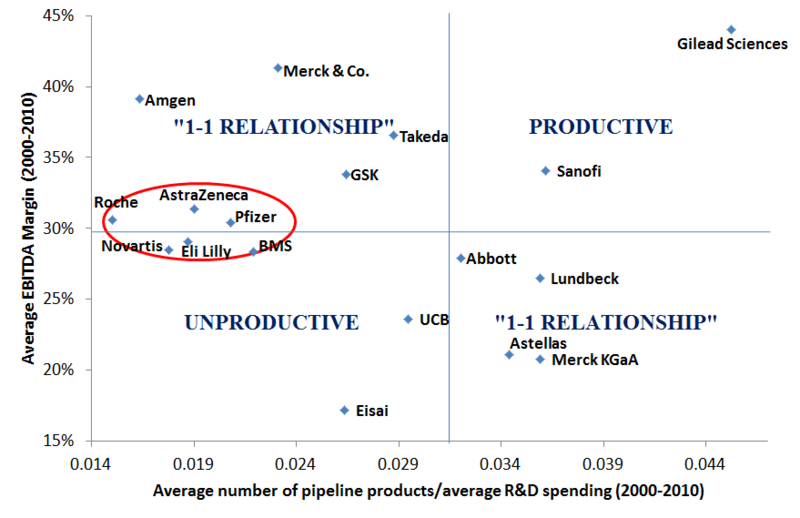 It can be seen that a major part of Big Pharma (Roche, Novartis, Eli Lilly,AstraZeneca, Bristol-Myers Squibb and Pfizer) is in the border between “PRODUCTIVE” and “1-1 RELATIONSHIP”. This means that pharma’s average R&D inputs lead to the average financial performance (EBITDA margin). This shows the life cycle aspect of these companies and more specifically their maturity. Their global presence and their huge infrastructure create several issues (including communication, lack of focus on or inability to identify key pipeline products if pipeline is full of other products). 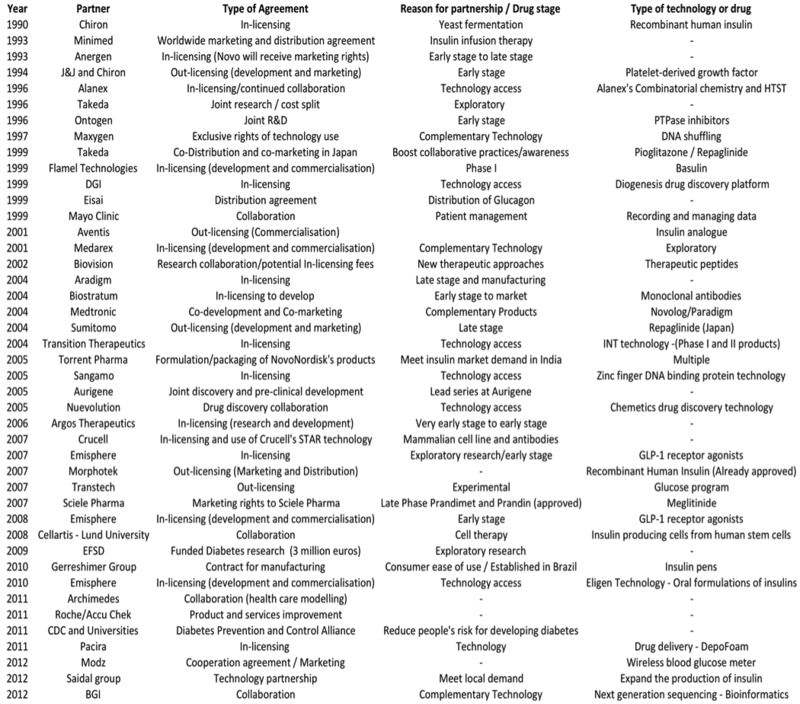 If you find this article interesting do not miss the next one which will focus on a more qualitative approach related to the source of innovation in the pharma and biotech sector.